The first project of CYLAND media art laboratory was cyberperformance “Speedless”, made in the fall of 2007. The author of this project is Anna Frants (New York) with the participation of CYLAND members. 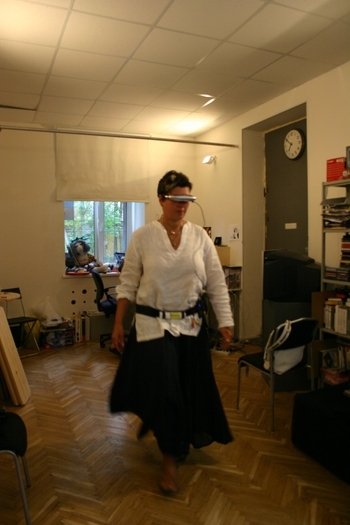 A man, involved in performance (“user of video glasses”) controls a video recording, which he sees in video glasses, by movements of his body, changing speed and trajectory of motion. During the demonstration of project there is an interaction with audience (happening) and participants who are located at different geographical locations contact not only artificial reality in glasses, but also an auditory, which reacts to his actions.